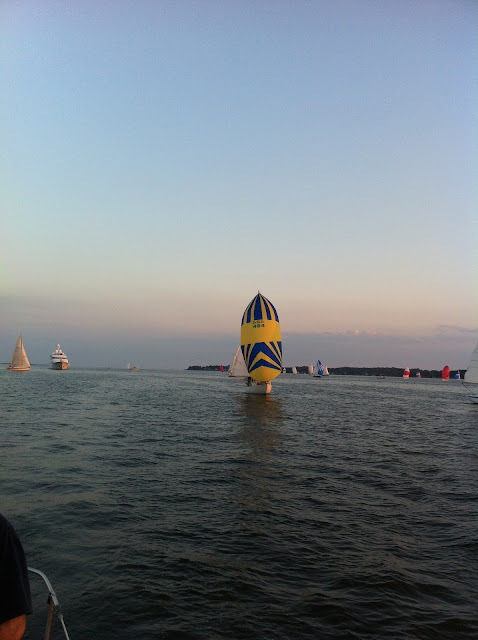 The wind was very light as Skybird loitered near the starting area for the final Wednesday Night Race. LinGin, Second-2-Nun, and most of the others Albergs looked to be trying for a pin-end start so I came down the line from the boat end, hoping just to have clean air with which I could build speed (OK, momentum - these are Albergs after all). One smaller boat seemed to be heading right for me on port. I called "starboard" but this J/22 still came on and tacked directly in front of us as the gun sounded. I had to luff up sharply, then as we slowed I turned down to keep moving in the light winds, all the while thinking "Really?!? What are you doing here? Wasn't your start 10 minutes ago?!?" I'm still shocked I didn't hit their stern. Finally they tacked away. Asylum looked like she had a clean start at speed between us and the pin while the other Albergs were in a crowd at the pin end. After tacking we worked up the right side of the course. Asylum tacked but looked to be short of the mark so we stuck it out a bit longer. Extra tacks seemed like a bad idea in these light winds. As the wind faded further I feared being left behind in a hole, and when we also hit a header it was time to tack back. Heading back to the mark we encountered a huge wind shift that eventually lifted us all the way up to the mark and left Asylum over-stood. I had long since lost track of the other Albergs, but somehow it looked like we would be first to the windward mark. 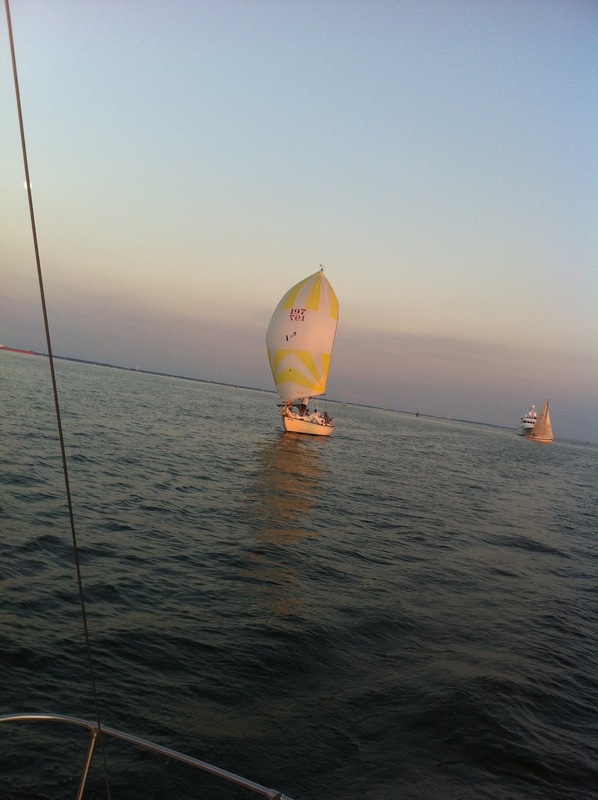 Just to make things more fun, on our final approach a PHRF boat tacked below us then pointed up to make the mark. We were ahead but just couldn't break the overlap in time. 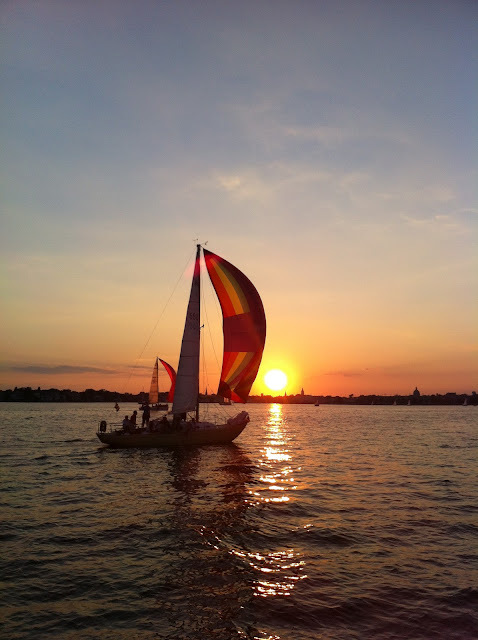 Having already prepared for a gybe set, the mark rounding seemed to last forever as we waited for the PHRF boat inside us to turn downwind before gybing. When we finally gybed there was Asylum, sailing right past our stern at speed and about to hoist her spinnaker. As I looked back I saw at least two other Albergs beyond Asylum hoisting, so it was still anyone's race. The downwind leg was a drag race to the nun buoy, with Skybird and Asylum a couple of lengths apart. As the little puffs came and went we would pull away a bit, only to get reeled back in by Asylum. My sheet trimmer Laura and guy trimmer Jim did a great job getting the most our of our chute and we managed to hold them off, the RC finishing us at the nun just four seconds ahead of Asylum. Second-2-Nun and Laughing Gull both finished less than a minute later, followed by LinGin and Argo. During the run Tim Adelman was able to take some great pictures as Asylum fought us all the way to the finish line. Well done to all those who participated in the Annapolis Yacht Club Wednesday Night Races. Here are the final series results.